I have been awaiting this book for some time, and it did not disappoint. I have read two other books on the case – “Bad Blood” by Don Davis and “Blood Brothers” by Ron Soble and John Johnson. Both are biased in favor of the prosecution but did include some insight into the Menendez family dynamic. However, both books ended with the conclusion of the first trial. 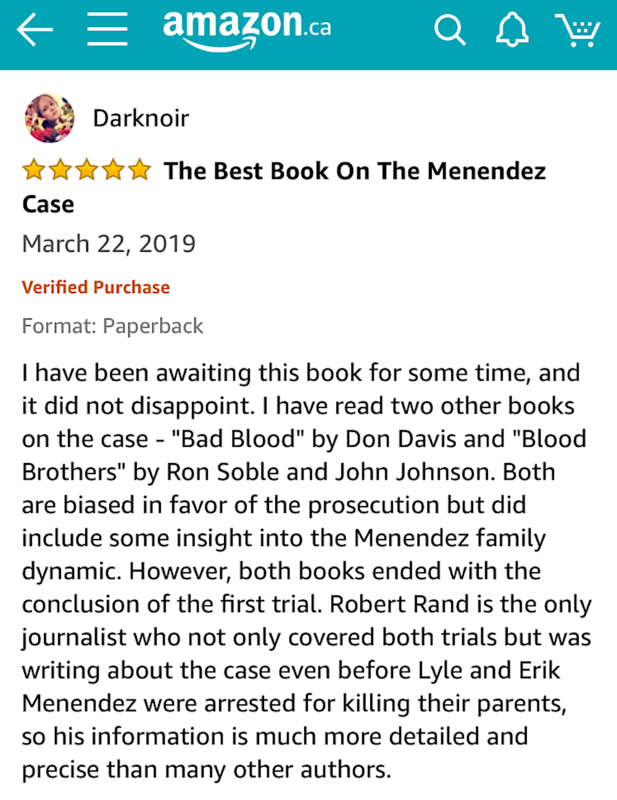 Robert Rand is the only journalist who not only covered both trials but was writing about the case even before Lyle and Erik Menendez were arrested for killing their parents, so his information is much more detailed and precise than many other authors. First, let me mention that there have been many misconceptions about this case that have been distorted in the mainstream media and LA County Prosecutor’s Office, as well as outright lies. Even before the brothers were arraigned, the Beverly Hills Police Department was telling the reporters that money was the motive for the crime, despite the fact that there was no evidence to support that; the grand jury refused to cite monetary gain in relation to the murder charges. Yet, the prosecution continued to present this theory as fact; and the surviving prosecutors maintain that money and hatred was the motive. Rand’s exhaustive research and interviews reveal not only a dysfunctional family but a cycle of abuse that was generational. The majority of the brothers’ family members remain supportive of them and even testified on their behalf in the first trial, along with teachers, coaches etc. It was the defense attorneys’ contention that years of abuse – physical, emotional, psychological and sexual, and fear that their parents would resort to murder to keep them from exposing the family secret – was what ultimately lead to the then 21-year-old Lyle and 18-year-old Erik killing their parents, Jose and Kitty Menendez in August 1989 in Beverly Hills. The prosecution mocked this, and continually re-victimized both defendants during their testimony; something that in today’s world, particularly with the rise of the #metoo movement, is appalling and outrageous. The first trial ended in hung juries and due to the embarrassment of both failing to get a conviction not only in the Menendez case but also that of O.J. Simpson, as well a chance for political and career advancement, the second trial was a farce. The judge and new prosecution team did what was possible to block evidence and witness (including psychiatric experts who had examined the brothers) until the penalty phase. This resulted in a conviction for first-degree murder. Some of the blocked defense witnesses were permitted to testify to determine sentencing, but the core of the Menendez brothers’ defense was suppressed. A miscarriage of justice no matter how you look at it. While Rand contends that he can’t confirm or deny the sexual abuse, he does present evidence that was not only brought up at the first trial but also from interviews he conducted before with Erik Menendez, family members and one of Lyle’s friends at Princeton, Donovan Goodreau who confirmed in three separate interviews that Lyle had told him about the sexual abuse before the killings and at least two years before the first trial. Finally, it cannot be ignored that Jose Menendez exhibited narcissistic and abusive behavior, in business and toward family members. This was someone who masked his insecurities by bullying and attacking others to not only get ahead but to feel superior; he did not see his sons as individuals but rather as extensions of himself. (In recent years, there have been allegations that he may have sexually abused other young boys). Kitty was emotionally and mentally troubled, and was more concerned with keeping her husband (who was also unfaithful) and her lifestyle than protecting her children. 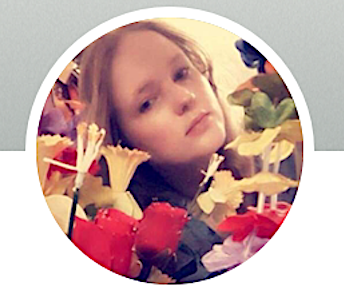 Having witnessed domestic violence in her own childhood, and not given the love and nurturing she needed, she became an undemonstrative and distant parent, unable or unwilling to give her sons the guidance and care that they so desperately needed. This kind of cycle is extremely destructive and can lead to terrible tragedies. Just because a family appears to “have it all” and can put up a front in public does not mean that mistreatment is not happening behind closed doors. Kudos to Robert Rand for giving a fuller picture of this case and for clearing up the misconceptions that have been so often presented. The Menendez brothers deserve to be heard and to be given a fair trial, something that they have so far been denied.